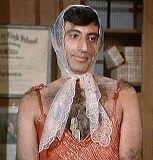 Claim To Fame: Jamie Farr is an American television, film, comedian and theater actor best known for playing the cross-dressing corporal from Toledo, Ohio, bucking for a Section 8 discharge, Maxwell Q. Klinger in the CBS television sitcom M*A*S*H.
Family Life: Farr has been married to Joy Ann Richards since February 16, 1963. Together they have two children. Info: First acting success was at age 11 when Farr won two dollars in a local acting contest. Graduated from Woodward High School with honors and was named most outstanding student. Attended the Pasadena Playhouse where a Metro-Goldwyn-Mayer talent scout discovered him. Worked as a deliveryman for a lithograph company, a post office clerk, an army-surplus store clerk, an airline reservations clerk and an employee at a chinchilla ranch. Has an LPGA tournament named in his honor, the Jamie Farr Owens Corning Classic (formerly the Jamie Farr Kroger Classic). As of 2005 was on the St. Jude Children's Research Hospital Professional Advisory Board. Trivia: His acting mentors are Danny Thomas and Harry Morgan. His M*A*S*H (1972) character was originally only supposed to be on one episode, but he proved so popular that he returned as a day player, and was finally given a contract in the third season. Thought at first the women's wardrobe in his dressing room meant he'd be sharing the room with a woman, but was surprised to learn otherwise. Not wanting to play a cross-dresser in the typical girlish way, he suggested to the producers that his character be manly, but crazy, thinking his clothes and other quirks were normal. The unusual spin worked. Was one of two cast members of the original M*A*S*H (1972) television cast to have actually served in the armed forces in Korea; Farr's tour of duty came in the years after the war. Alan Alda served a six-month tour as a gunnery officer in Korea. In addition, the dogtags Farr wore on the M*A*S*H (1972) set were actually his issued set from his time in the army. Was in attendance at the "Miracle on Ice" game between the US and the USSR at the Olympics in Lake Placid, NY. He said that there was a ticket available but he ended up on the Russian side surrounded by Soviet dignitaries. Where Are They Now: Between late 2016 and 2018, Farr was seen promoting the M*A*S*H television series and other classic television series on the MeTV television network. And as recently as 2018, he's appeared on the FOX comedy The Cool Kids and the film Angels on Tap.